If you are drowning in debt, here's a plan to get back on firm financial ground. You can't pay your bills on time. You make only the minimum payments on your credit card each month, and that's difficult. You're always "at the store" when creditors call. You continually apply for new credit cards. No, I'm not one of those pesky creditors who's been calling your church office or haranguing you at 9 p.m. at home. I'm a friend — and a financial expert — who knows what it's like to be drowning in debt, and I want to give you a hand out of the morass. And for those of you smugly thinking, I'm glad this isn't for me, stick around — I have something for you, too. For most of you, the downward spiral began with three words: "Just charge it." Though your ministry may provide you with a house or car, your paycheck didn't cover all your expenses — new clothes for growing children, unexpected medical costs, car repairs. It was easy to whip out the Visa and comfort yourself with the thought of 25 days of "cushion." But when you added these consumer debts to prior bills, such as school loans, you were overwhelmed. You realized that the $5,000 you borrowed at 18 percent interest will turn into more than $9,000 if you make only the minimum payments for eight years. So here you are, sunk beneath a pile of bills. If you're doubting whether your resources will ever be enough to relieve your financial burden, you've come to the right place — a little planning, some discipline and a few lifestyle changes will make that possible. And for all you doubters out there, repeat after me: No situation is impossible. Gear up for a difficult task. I would be lying if I tell you that getting out of debt will be as easy as getting in was. The process can take months or years. As you plan your debt repayment, pray with your spouse that God will give you both the discipline to stick to your plan. Remind yourself that paying back your debt is the most honorable way out. Stop charging. Right now, gather all your credit cards, a pair of scissors and let your children cut them up. (This may be a good time to call the kids in for a quick "bad money-management" illustration.) Tomorrow, call your card issuers and cancel your accounts. Agree to take no more loans — not even from your friends or parents. Remember, this is serious stuff: You can't keep charging if you ever hope to see light. Face the facts. List the amount of all your debts, your regular monthly expenses (e.g., groceries) and your take-home pay. Subtract your monthly expenses and your debt payment from your take-home pay. If your expenses and debts exceed your take-home pay, go directly to the next point: "Call your creditors." If you're in the black, put the extra cash toward repayment of your loan with the highest interest rate. Cut back on your lifestyle. Make your present income go farther by cutting back on any options — buying your lunch instead of brown-bagging it, high phone bills, etc. Apply every cent you save toward debt repayment. Get to work. To bring in more money to pay your debts, consider getting a second job or asking your spouse to work. Yes, this may create some physical and time stress for a while, but think of all the stress you're under dodging creditors. Use laddered payments. Paying off your high-interest cards first is the smartest financial move. But if you find that $6,000 Visa bill overwhelming, begin small. Add any surplus funds to the minimum payment on your smallest loan balance and continue doing this until the smallest balance is paid off. Then take the amount that you were using to the eliminate the first debt and add that to the minimum payment you were making on what is now the smallest outstanding balance. Repeat this process until your debts are cleared. A credit junkie might as well be carrying live hand grenades if he's willing to put charge cards in his wallet. Don't carry credit cards. When an alcoholic overcomes his drinking habit, no one advises him to carry a flask of whiskey in his back pocket. A credit junkie might as well be carrying live hand grenades if he's willing to put charge cards in his wallet. Remember that sinking feeling. When confronted with an opportunity to charge, recall how awful it felt to owe someone money. Don't confuse needs with wants. Jesus defined food, clothing and shelter as our needs (Matthew 6:25-32). Wants, however, are those thing that meet our needs at a high-quality level, such as big houses, expensive cars and designer clothes. Don't fall into the trap of wanting the "wants" and using credit to get them. Don't throw out your spending plan. Here are the rules: Use no more than 70 percent of your take-home pay for daily living expenses; give away 10 percent of your income (e.g., tithing); use no more than 10 percent of your income for debt reduction; and save 10 percent of your income. Saving for emergencies before they happen — and they will happen — is crucial to avoiding debt. Shortly after we were married, the first credit card application showed up. At first we were dead set against filling it out, but after a little discussion, we finally gave in. We were approved almost immediately. Soon after, other cards followed. Each time we had an emergency — car repairs, unpaid taxes, a weekend getaway — we'd pull out a card. It all seemed so easy. Before we knew it, we had three or four cards that were charged to the limit. We tried setting up a plan to pay off the debts. The money was always there on paper, but somehow we never saw it in the account. My husband and I would tell each other that things would be much better once the next raise, next promotion or next job came along. But it never worked out that way. Five years into our marriage, we were $20,000 in debt. We were paying for extravagant meals we had long since forgotten and furniture that had already worn out. The more we made, the more we had spent. We looked around in desperation and asked each other, "How did we get here?" That day, my husband and I began researching ways that we could turn around. We gathered all the information we could find about living with a cheap mind-set, contacting creditors, tithing, creating a spending plan — you name it. Our efforts at debt repayment did not come without sacrifice. I was determined to remain at home with our three young children, so I began baby-sitting at home. My husband began delivering newspapers. At the time, it was an embarrassing thing to do, but that didn't compare to the burden of debt we were carrying. Now, three years later, we have completely paid off the debt. For the first time, we are actually saving money and look forward to buying our first home. We have even set up a separate account for emergencies. We are committed to avoiding consumer debt altogether. The National Foundation for Consumer Credit has Consumer Credit Counseling Service (CCCS) offices around the United States that give free help to those struggling to pay back debts. Find a CCCS office near you by calling (800) 388-CCCS. Step 1. Add up all your monthly debt payments — credit cards, mortgages, school loans, car loans, for example, but not utilities, groceries or insurance. Step 2. Divide that number by your monthly gross income. Less than 33 percent — you're in great shape. 34 to 37 percent — you're fine, but you're compromising your ability to accumulate long-term savings. 38 to 50 percent — you're starting down the slippery slope of financial hardship. 51 percent or higher — you're in trouble. If your mortgage is paid by the church, subtract 30 percent from these categories. Pay the Minimum? You Must Be Kidding! "I know that some of you out there aren't even close to being able to pay the minimum on your credit card statement. Your income barely buys groceries. But no case is hopeless — you have to believe me on this. "Let's say you have $75,000 in total consumer debt (unsecured debt, such as credit-card loans) and you haven't made payments for months. Now is the time to face the music. You must communicate with these people. "If you can't speak coherently with them on the phone, write a letter. Even if your letter says you are going to pay each creditor $5 a month, that is where you should start! You have my permission to use the following letter verbatim — but plug in your own numbers!" I am writing to you about my account referenced above. I regret that I have failed to abide by the original terms of our agreement. I want you to know that I am committed to full repayment in the amount of $________. I have undertaken a financial recovery program and have received assistance in assessing my financial situation. I am doing all I can to avoid filing bankruptcy. Your account is one of the many that I owe on; my total debt is $________, and my monthly payments total $________. You can understand that my present net monthly income of $________ less my living expenses does not leave me enough money to pay even the minimum monthly payments. Enclosed please find my check for $________, which is the amount I will be able to pay each month on my account for the next six months. At that time, I will review my situation and may be able to increase my payments. Also, I respectfully request that the interest rate you are charging be reduced so that a greater portion of my payment will go toward principal reduction. I look forward to learning that you have processed this payment. If, however, you are unwilling to work with me as outlined above, please return the enclosed payment so that I can send an additional payment to another of my creditors who has agreed. Taken from Pastor's Family magazine, Feb/Mar 1997. Article copyright © 1997, Ray Linder. 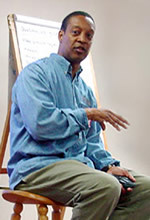 Ray Linder is the founder and CEO of Goodstewardship.com and an internationally recognized teacher of team success and personal development. He is author of three books, including What Should I Do With My Money? — How Your Personality Affects Your Financial Behavior. Ray is an associate of Otto Kroeger Associates, the world’s leading training firm for the Myers-Briggs Type Indicator. He has over 25 years of business experience including corporate finance, investment management, fundraising and development, consulting, sales, pastoral ministry, and small business management. Ray, his wife Christine and their two daughters live in Sterling, Virginia.